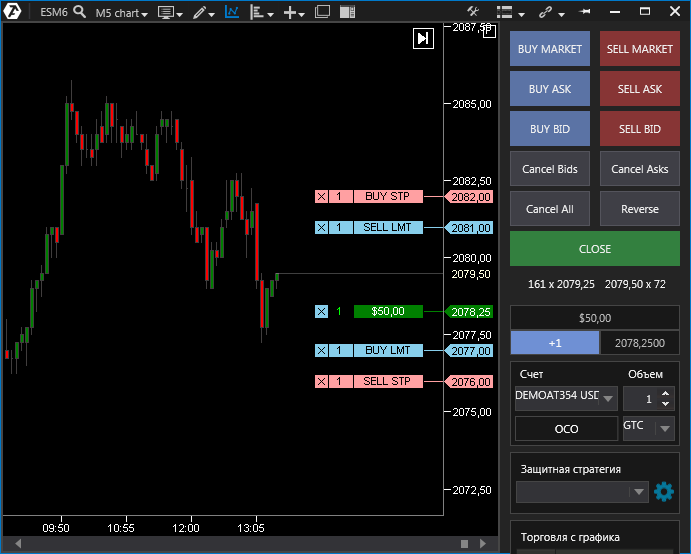 The Chart Trader module is designed for trading and enables trading both using trading buttons on the panel to the right (see the figure below) and from the chart itself. 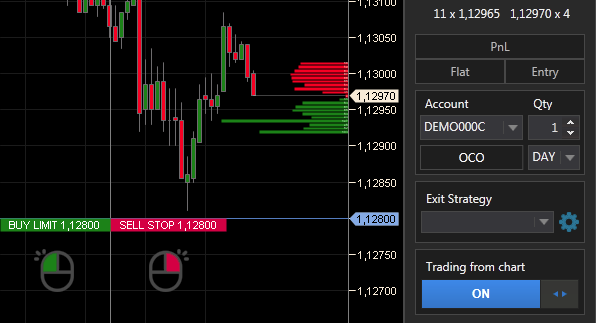 To open a trade module, use the icon in the chart menu panel, which will open the Chart Trader module on the right on the chart. BUY MARKET: a market buy. SELL MARKET: a market sale. BUY ASK: set a buy limit to BestAsk. SELL ASK: set a sell limit to BestAsk. BUY BID: set a buy limit to BestBid. SELL BID: set a sell limit to BestBid. Cancel Bids: cancel deferred buy limits. Cancel Asks: cancel deferred sell limits. Cancel All: cancel all deferred orders. Reverse: reverse the current position, i.e., close the existing position and open the opposite one of the same size by sending the opposite order of the double size. Close: close the current position and cancel all the deferred orders. * All of the above trading functions can be configured using hot keys. You can find more information about configuring hot keys here. - displays the information about the number of contracts / lots placed for Best Bid / Best Ask. PnL indicates the result of an open position. The PnL display type can be changed. To do this, left-click on the PnL area. Available modes: PnL in money, interest, ticks, or Do not Display. FLAT - this option indicates the amount of the open position in contracts/lots. The sign indicates the direction of the open position (long (+)/ short (-)). Entry: the price of an open position (can be averaged if the position has been entered a few times). * The data of PnL, FLAT, and Entry are displayed only after the position is opened and only for the given instrument and account! Account: selecting the trading account. Qty: setting the size of the order for sending. OCO (One Cancel Other). If one of the orders included in the OCO group is filled, the other order is automatically canceled When placing one of the orders, the price at which it will be placed is indicated at the beginning (i.e., the order is not actually placed and is displayed in yellow); when placing the second order at the set price, the OCO option is triggered, and both orders are automatically placed at the given price at once (in this case, the orders are already placed and are displayed in the color of the corresponding type of order). Duration of orders: DAY- until the end of the trading session; GTC - until manually canceled. Section to select and adjust the parameters of exit strategies. * You can find more information about exit strategies here: Exit Strategy. 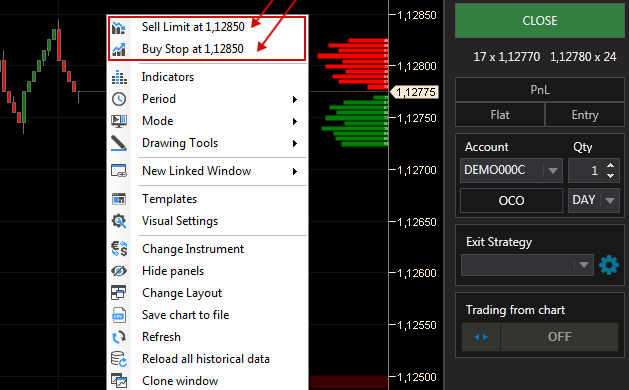 You can do this by left-clicking on the “Trading from chart” switch or by holding the space bar on your keyboard (this key is configured on the platform by default, but you can customize it according to your preferences in the window Hot Key Manager). * You can find more information about chart trader modes here. Placing a buy limit order (Buy LMT). If the mouse cursor is below BestBid, left-clicking will place a buy limit order (Buy LMT). Important: dragging a Buy LMT order to the BestAsk price or higher will trigger the exchange mechanism of order consolidation, and this buy limit order will be filled automatically at the BestAsk price! Placing a sell limit order (Sell LMT). If the mouse cursor is above BestAsk, left-clicking will place a sell limit order (Sell LMT). Important: dragging a Sell LMT order to the BestBid price or lower will trigger the exchange mechanism of order consolidation, and this sell limit order will be filled automatically at the BestBid price or lower! Placing a buy stop order (Buy STP). If the mouse cursor is above BestAsk, right-clicking will place a buy stop order (Buy STP). Placing a sell stop order (Sell STP). If the mouse cursor is below BestBid, right-clicking will place a sell stop order (Sell STP). An active order can be moved for the desired price by holding down the left mouse button on the order label and dragging the order to the required price without releasing the button. X button on the order label. Cancel Bids on the Chart trader panel to the right: this cancels all the bid limits (Buy LMT and Buy STP). 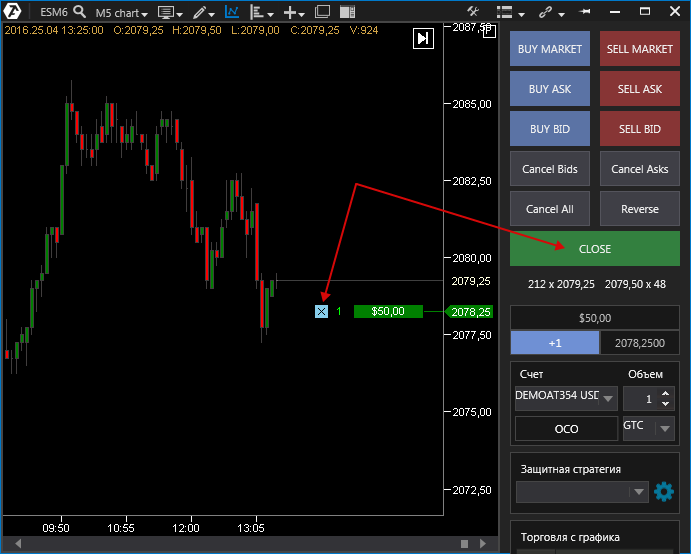 Cancel Asks: this cancels all the ask orders (Sell LMT and Sell STP) on the Chart trader panel to the right. Cancel All: this cancels all the deferred orders for the given instrument and account. the CLOSE button (important: if there is an open position, it will also be closed). Click the X button on the position label. 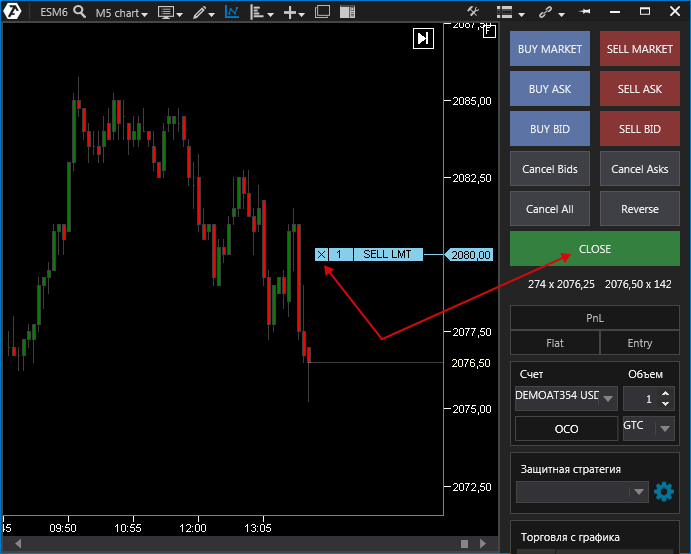 Use the CLOSE button and removing all pending orders from the Chart trader panel on the right. 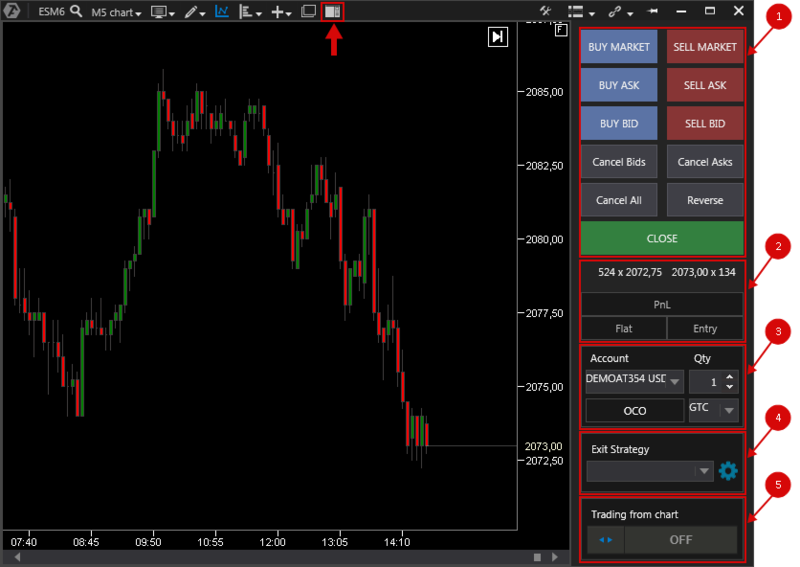 Place an opposite order with using trading buttons or the Chart Trader function. Route: This option allows selecting the router (ECN) through which the order will be sent. Please note: This option is only available for stock trading on the US stock market. * This option is not on displayed on the Chart Trader panel by default. It can be added using the Edit Mode.